Arianespace successfully launched ESA’s Aeolus climate science satellite on their Vega rocket today. It is a much smaller rocket than we have been seeing with ULA and Spacex lately. You can sure see the acceleration it gets being smaller and lighter, looks like it move like a bat outs hell compared to the others. One effect may just be the difference in height/length. ( 30m vs ~50m ). you often perceive speed magnitude in relation to vehicle length. a longer vehicle at the same speed takes longer to pass from one end to the other. May look slower but isn't. Agreed. I would highly doubt it's accelerating any faster than other modern rockets. More G's means more structures which means less payload. This is true, but when it comes to acceleration, smaller vehicles are often quicker than larger ones. e.g. Cars accelerate faster than trucks. Yeah but when you're carrying precious cargo in your vehicle (car or truck) you don't accelerate too fast or you'll tip the wedding cake over and it will spill everywhere. Doesn't matter if you're in a F350 or a prius or a Bugatti veyron. I was looking through the live telemetry of some of the Falcon 9 launches for comparison with this Vega launch. The mission was to launch a satellite into a sun-synchronous orbit (SSO), so I picked the Falcon 9 launch from Feb 22 which was used for the same purpose. I've seen other Falcon 9s doing between 8,000-9,000 km/h at the same mark but those were to different orbits, so I'm not sure if you want to use those. However, I think it is fair to say that the Vega considerably outpaces the Falcon 9 here. (Note: wanted to use a timestamp closer to launch but the Vega video doesn't provide one until about the two and half minute mark). That's quite a bit of difference velocity wise. Good evidence. Vega achieved Max Q about 15 seconds earlier than Falcon 9 did. So something is fishy there because at that point Falcon 9 is higher altitude than Vega but Vega is now moving faster. So, Ariane is capable of larger acceleration than Vega at liftoff. Falcon 9 and Atlas 5 are not. Vega leaps off the pad and accelerates 20% faster than F9 and 45% faster than Atlas, which I would think should noticeable to the naked eye. In relation to Ariane, I think the perceived difference in speed early in the launch between Ariane and Vega is likely related to the size of the rockets, as you point out. 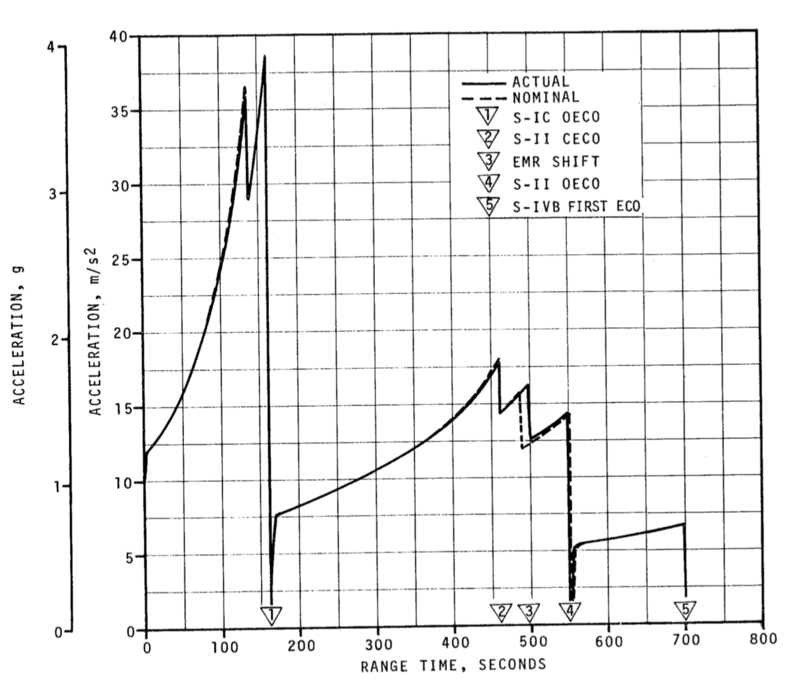 Their initial performance off the pad are similar, but Ariane sheds mass much faster (result of three engines running through 1st stage) and is likely much faster than Vega over time (in terms of velocity as a function of time). This is also true of F9, which burns mass at a similar rate to Ariane. 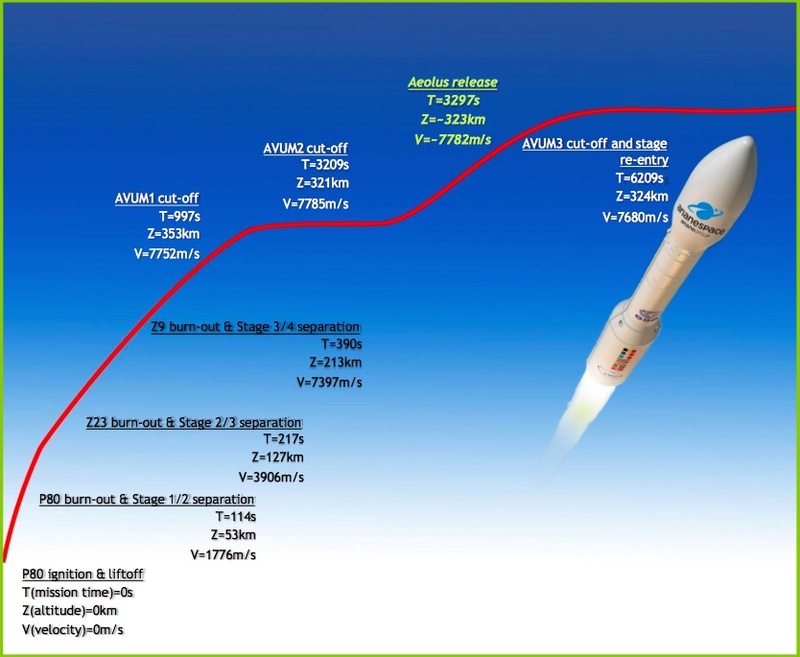 So as time passes, F9 would catch and surpass Vega if they were racing to an orbital altitude. This is my first shot at trying to compare rocket velocities based on mass and thrust, so hopefully I’m in the ballpark. Last edited by Tugger on Thu Aug 23, 2018 7:54 pm, edited 2 times in total. Thanks Tugg, I knew something had to be awry there. That re-orients everything into making sense. Vega still leading the pack in altitude and velocity but the pack is gaining. Another thing to consider, at least with Vega vs F9. Vega has 3 stages whereas F9 has only 2. Are all three stages of Vega Solid Rockets or is the last stage a liquid? First three stages are solid (HTPB 1912) according to the site I posted above. Fourth stage (AVUM) burns hydrazine/nitrogen tetroxide. And another correction! I feel enlightened already. Well, to summarize my position. I find it interesting that they accelerate so fast. As a structures engineer I cringe a little thinking about the g forces applied. I'm sure it's all taken into account and just fine. I wonder if that's why the F9 is a little slower out of the gate. So that they can also be man rated. than the 2 stage systems. Something to potentially consider here is if SpaceX was trying to gain data for their recoveries I.E. flying a profile closer to that of a launch they were trying to recover even though the one referenced above was expendable. I don't know the answer and may be way off base, I was hoping you guys could chime in. Should have thought about this earlier but I think we have good enough data to work out a sense of what the actual average acceleration is like. So the Vega does what, 1.6 - 2g and the Falcon 0.8 - 1g? I don’t know if those G-figures can be supported. To lift off, the rocket must surpass 1G. So add 9.8 m/s^2 to each of your acceleration figures to account for the force of gravity. My estimation gets less accurate as time passes since the flight path changes from perpendicular to the force of gravity to the parallel to it, but you get the idea. Either way, Vega puts more G-load on the payload and therefore accelerates faster, as you said. Oops sorry, it's been more than a decade since my last physics class and it has nothing to do with my profession either. I tried, haha. Vega acceleration is still 2x Falcon 9 though. And to trpmb6's point about man-rating, I've seen most sources put the maximum limit of such vehicles at 3g. You were definitely right on the point that Vega accelerates faster than F9. And yes, for man-rating, 3G seems like the standard for what an agency will subject a naught to. They might all be fighter pilots, but nobody wants them blacking out during launch. I am hoping it gives just a bit more insight that those more knowledgeable than I can use. you have to figure in gravity the rocket drive has to compensate for to begin with. So it is the vector sum of 1g + a(rocket). a simple sum as long as you go straight up. On page 20 and 21 of the Falcon 9 User guide, there is a discussion about axial and lateral loading. For a typical 4000 lb payload the design envelope has a maximum 6g axial requirement (combined simultaneously with a 0.5g lateral loading) and a maximum 3.5g lateral requirement (combined simultaneously with a 2.0g axial loading). So these would be the do not exceed limits of the flight envelope. Interestingly, on page 21 they make a note. For payloads of 2000 lbs or less (ultra-light payloads they call it), they have a secondary profile. With g loading as high as 8.5g axial and 4.0 lateral (not occurring at the same time - see the graphs they are very helpful in visualizing the envelope). There's other cool nerdy stuff in there as well. That being said, I'm pretty disappointed they used the basic Microsoft word template. Didn't even bother to create their own styles. Lame. Great chat everyone! Nice to rummage around in some of these weeds, even if it is just some wags based on the limited public info. This is the coolest thing I’ve ever seen posted on this site! I read lots of the 55 pages of PDF leading up to your figure. So fun. You can see they didn’t want to accelerate faster than 40 m/s^2, so they cut the center of the five F-1 engines as they approach 36.5 or so (3.7G). It’s not noted in the events on the chart, but it’s in the abbreviations section of the PDF as CECO (center engine cutoff). Five seconds of weightlessness until stage 2 starts, which comes with a solid kick going from 0 m/s^2 to about 7.5, but it’s less than 1G for about 110 seconds. They CECO stage 2 at 460 seconds (event 2), adjust the the engine fuel mixture ratio on the remaining 4 engines at 498 seconds (event 3) and shutdown the remains four engines at 548 seconds (event 4). Stage 3 has just one engine fire and it fires at 552 seconds and burns until 699 seconds (event 5). Official parking orbit insertion marked at 709 seconds. So the real fun happened during the first stage with all 5 F-1 engines burning. As they burned through fuel and the rocket lost tons of mass, the acceleration climbs like crazy. So fast in fact that they had to shut one down before all the fuel was spent so the crazy people on top of the stack didn’t black out or worse. For the rest of the stages, the engine cutoffs and restarts would be pretty good jolts, but the raw G numbers never surpass about 1.9G. That’s pretty similar to the bottom of the forst on most rollercoasters, I’d estimate. Also, cool graphic on human capabilities. I wonder if we can artificially increase this range somehow in the future. By the way, congrats to Arianepsace on their 100 successful Ariane 5 launch last night! So the BepiColombo mission to Mercury launches tonight, in less than 2 hours. Bepi Colombo came up when I worked on Rosetta. These projects are nearly generation spanning.